Option-Based Pricing allows you to define pricing based on a range of characteristics of a product and the options chosen. When setting up pricing options, it's important to understand how the Price and Price Option settings work together. In a nutshell, how the price for an option gets added to the cart will depend on both the price and the price option. The base price for the product when that option is chosen. Overrides any original price (e.g., if you have a price entered in the main product price field). IMPORTANT: Do not select a Price Option of "base" if the price of the option is $0. This is often used for set up fees. Let's say you have a "Lip Balm" product that comes in four flavors. Here is how you would create the options for this item. This is the label for the drop-down option menu and should be the same for each option. This is the name of each individual option within a group. 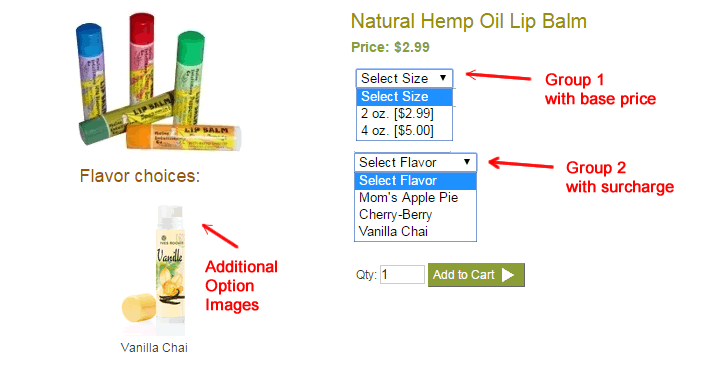 With one group of options you'll most likely set this to "base"
Both: Displays the option in the drop-down menu and displays the option image as an additional product image. 7. Enter any other information, such as display order, sku number, weight, and inventory, as needed. 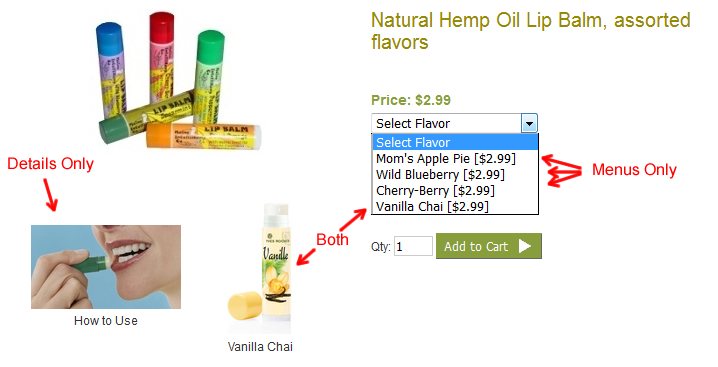 In this example, you have a lip balm product that is available in two sizes and three colors. Set one group of options to "base". Only one group can be set to "base". Additional groups will usually be set to "surcharge", but in some instances you may want to choose percentage/dollar off base price, or one-time charge. If you enter a price on an option set to a price option other than "base", that amount will be added to the "base" price. In this example, you offer a foot spa that comes in two sizes and can be purchased with an optional package of bath salts. Optional groups willl only have one item in the group. Optional groups will dislay as a checkbox and will not display the Group Text. Your add-on option should have option text that will make it clear the item is an add-on. 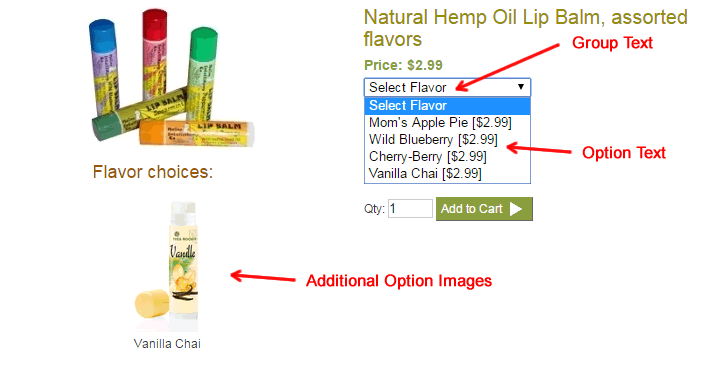 Tip: Use a combination of the above examples to create product packages. Quantity pricing allows for price breaks when certain quantities of an item are purchased. Quantity pricing may be added to any option. Note: Not all sites will have the quantity option field active. If you have the need for quantity pricing and do not have these fields active, contact HEROweb. The first "From Qty" field must start with the number 1, even if you have a higher minimum quantity set for the item. Notice that you have to repeat each option for as many price breaks as you are offering. Enter 0 in the final "To Qty" field. This means "any higher quantity". If you have some options that are only available if the user select another option, for example if certain sizes are only available in certain colors, you can set up dependent options. 1. First enter the main "Parent" choices and save. 2. 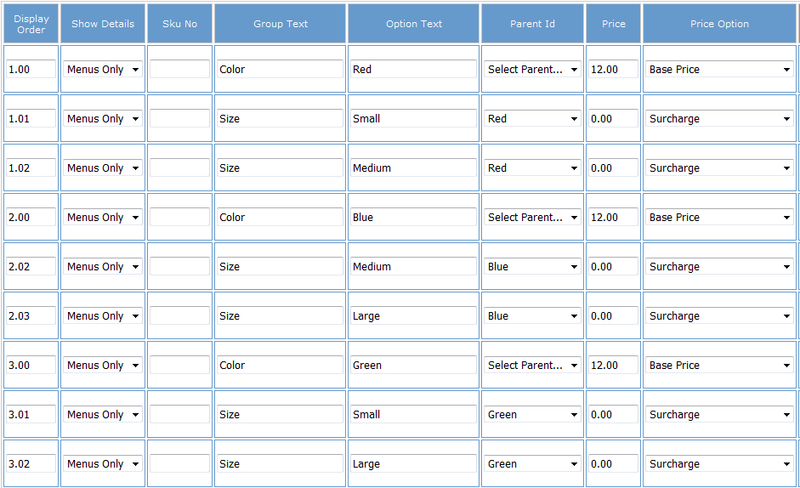 Edit the product again, this time adding the "Child" options and designating a "Parent" for each "Child". Note: if your site has inventory controls along with dependent choice options, you must enter an inventory quantity on the "Parent" line as well as the individual option line in order for any options for that parent to show on the site. If you have pricing or other options that are common to many products, you can "share" these across products. This way, if you ever need to update the pricing or options, you only have to update them in one place. 1. Add an item to your Shared Attributes category. Tip: If you have separate configurations that are frequently grouped together, you can create separate shared pricing options. For example, using the "finishes" scenario, you could create "Silver Finishes," "Gold Finishes," and "Copper Finishes" by using identical group labels in each option set. When adding a product you just check off which finishes this product comes in. 2. Assign the shared attributes to individual products. Edit the item that will include the shared attributes, then scroll to just above the options grid. You will see a list of your shared attributes. Check off the appropriate shared attributes (you can check off multiple, as needed), then save. 3. 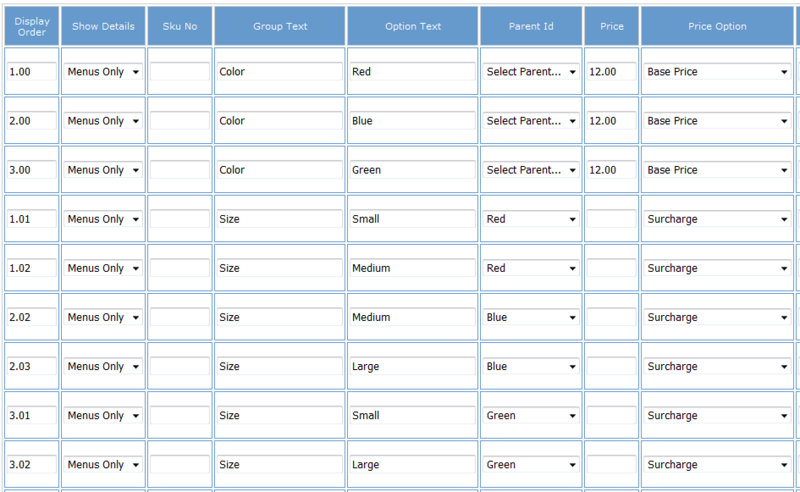 The product will now include any options entered specifically in that product, plus any assigned shared attributes. Menus Only, Details Only or Both? The "Show Details" setting affects where options and option images will display on the product detail page. Hide: The option will not display at all. The group text is required. Items in a group must all share the same "price type". Items in the same group must have identical group labels. We recommend using copy and paste to set the group label. Only one group can be set as the "base price". You never want to have an option set with a Price Option of "base" and a Price of $0.